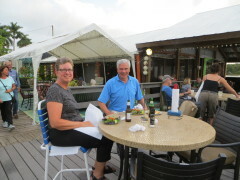 On Wednesday, we drove south toward Naples, stopping first in Estero at the Apple Store to get a new battery for my iPhone. 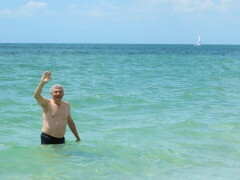 Don wanted to take a swim in the Gulf, so we found a public beach along Gulf Shore Drive and into the blue waters he went. 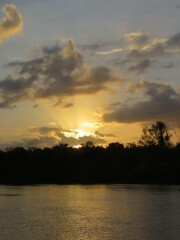 Not many boats, but a sailboat appeared in my photo. 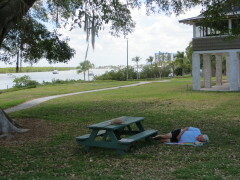 We called P.E. 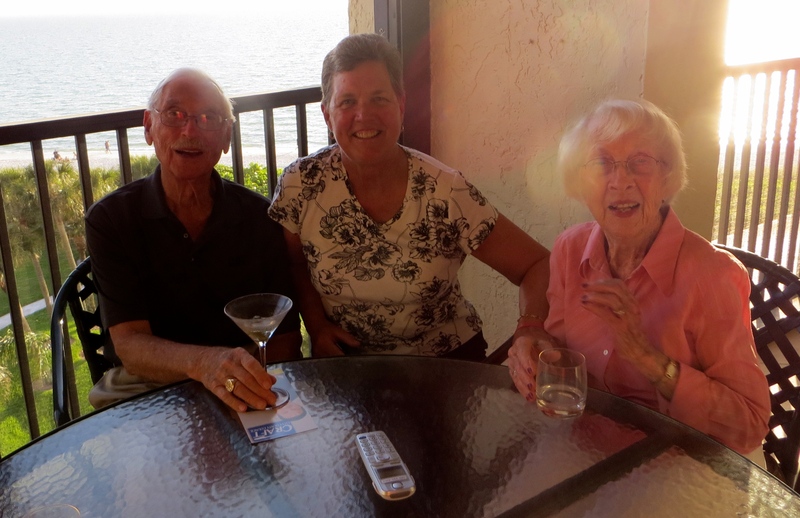 and Fran MacAllister from Northminster and they generously invited us to dinner at their condo overlooking Vanderbilt Beach. 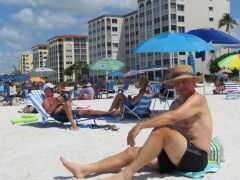 So much sun, there are spots on the photo. 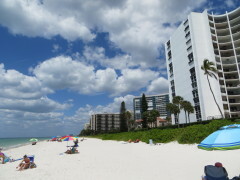 Don had reserved our hotel in Naples, via Priceline, and it was great. 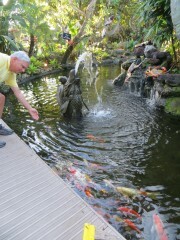 The breakfast was served at a Tiki Bar and there was statuary throughout the grounds. 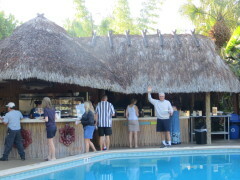 Breakfast at the Tiki Bar. 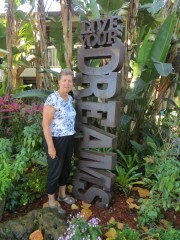 About to Live My Dreams. 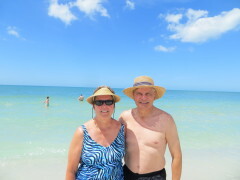 Thursday we drove to downtown Naples for some business, then decided to head north to explore Gulf beaches. 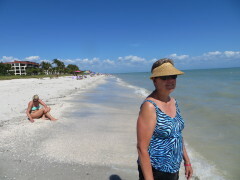 We swam and walked the beach at Bonita Beach, Fort Myers Beach and Sanibel – lots of fine white sand and shells. 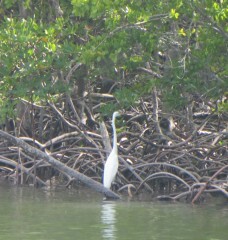 Today we headed east to start exploring in the Everglades. 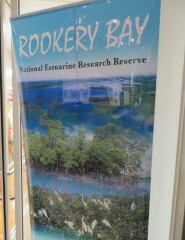 Our first stop was at Rookery Bay Estuarine Center, learning about the mangrove forest. 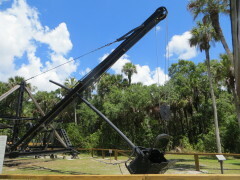 Next, at Collier-Seminole State Park, we saw the Bay City Walking Dredge, used to help build the Tamiami Trail in the 1920’s. 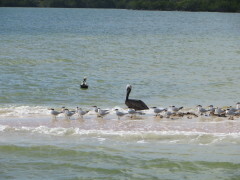 We continued to Marco Island, with beautiful homes and lots of water. 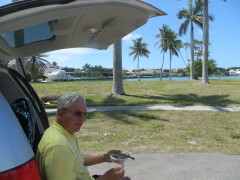 We bought a roasted chicken at Publix and had a picnic lunch off the back of the van, overlooking some of the houses. 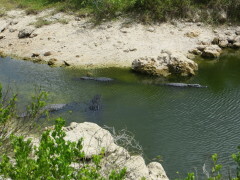 At the Oasis Visitor Center, we observed alligators. 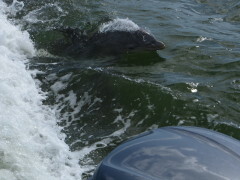 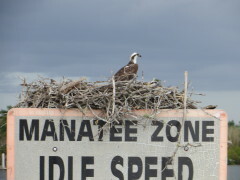 Then we took a 10 Thousand Island boat tour from the Gulf Coast Ranger Center of the Everglades National Park and saw dolphin, osprey, and pelicans. 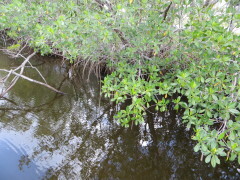 I’m still hoping to spot a manatee. 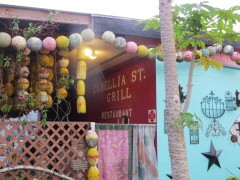 The boat captain recommended we eat at Camillia State Grill in Everglades City – and we thoroughly enjoyed our meal and the sunset. 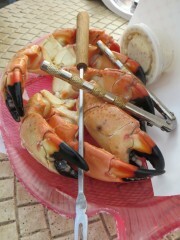 Stone crab claws, locally caught.